GLR Casanova Ruby is a great young twisting brindle with 55 1/2" TH at just 29 months old. Both her sire and her dam are over 80"TTT and she is ultrasound confirmed for a February 2019 calf from 84" RC Tsunami 2. This calf will bring your program Concealed Weapon and the cow power of the legendary Pacific Mermaid. 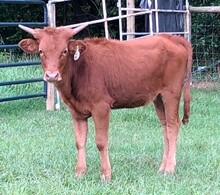 We have retained her 2018 RC Tsunami 2 heifer calf who is adding horn faster than a middle school band. 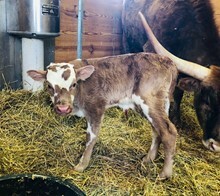 You want to add this beautiful total package cow to your program and sit back and watch the twist! HORN PEDIGREE: 4 ANCESTORS OVER 80" TTT; 10 ARE OVER 70" TTT.